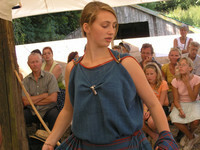 Dress yourself like they did in the Iron Age – wear woollen Diamond twill. Our guests and costumers ask for authentic fabric woven in prehistoric patterns. We therefore offer Iron Age fabric woven in diamond twill, made in cooperation with a professional modern weaver. In Sagnlandet Lejre, the Land of legends, we use the fabric for both Iron Age and Viking period costumes, but the hard wearing fabric is also suitable for other purposes. The quality is 14/14 threads pr. centimeter and the fabric is approx. 170 centimeter wide. We dye the diamond twill with plants in several different colours. The fabric is dyed in pieces of maximum 4 meters, but cat also be ordered in smaller lengths. Dying with plants is a handcraft and we will do our best to give the fabric the colour of your choice. 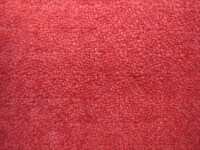 Woven fabric in diamond twill was very popular in 2.-3. Century AD – the period we in the North call Early Iron Age or Roman Iron Age. It has been used in both men’s and women’s costume. For instance is the famous horse riders costume from Thorsberg made in this type of weave. Diamond twill has also been used in the Viking period. It has been found in the graves from the Swedish Viking town Birka dated to the 10th century AD. Postage (+VAT) according to PostDanmark's charges. The payment is via bank transfer. Please allow approximately 2 weeks of delivery time.